LD: First off I would like to thank you for taking time out of your schedule to answer these questions for our readers. For those who may not be familiar with your work, care to share a little bit about who son of ghoul is and what it is that you do ? SOG: Son Of Ghoul is Northeast Ohio’s longest running costumed horror host. June 13th the show enters its 24th year on the air featuring classic B horror movies with SOG skits and segments. My show is broadcast every Saturday night at 7 P.M. on RTV Ch29 WAOH and RTV Ch35 WAX in Northeast Ohio. LD: I’m sure everyone in the industry has that moment where they were like “I want to be involved in horror” What made you want to work in the horror industry ? 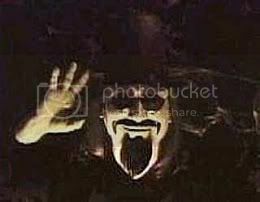 SOG: For me it all started in 1963 when Ghoulardi (Ernie Anderson) was on television in Cleveland hosting bad movies. He was a great part of everybody’s horror hosting efforts here in Ohio. I grew up watching all the other great TV hosts we had here in Ohio. I think Cleveland Television had more Kids Hosts and Horror Hosts from the late 50’s to present day than the rest of the country did. LD: You’ve seen endless numbers of horror films, what are your thoughts on all these classics being remade with Hollywood actors and big budgets ? SOG: Today’s remakes are more technical for sure but sometime lack the charm of the original films and actors. I’m old school. LD: I’m sure over the years you’ve met some interesting horror icons. If you had to choose one, who would be the biggest “wow” moment for you personally from a fan of the genre’s point of view ? SOG: The biggest icons I’ve met had nothing to do with horror. It was Paul McCartney and Stevie Ray Vaughan. In any genre that’s two big wows. In horror it was Ben Chapman (The Creature From The Black Lagoon) he was a good friend and we had great times hanging out together at horror conventions. He was a riot and a great story teller. I miss him a lot. LD: Before we go do You have any upcoming appearances you’d like to let our readers know about? Or anything else you’d to share with us? SOG: I will be at many conventions throughout the year so log on to my web site www.sonofghoul.net for updated list of SOG Appearances, DVDs, T-Shirts and E-Mail. There you have it, the one, the only, the great Son Of Ghoul. We here at Liberal Dead would like to send out a huge thank you to SOG for giving us the chance to interview him, and to wish SOG continued success in keeping the horror host craft alive and well.